In baseball it's called "small ball." That might be the best way to describe the improvising duo of saxophonist Ingrid Laubrock and drummer Tom Rainey. Small ball baseball teams win, not by home run blasts, but by putting runners in scoring position, bunting, and stealing bases. Flamboyant rarely wins the series. Confident, often understated play, is what connoisseurs of both baseball and improvised music seek. The partners in music here are also partners in life. Maybe that explains their agreeable interplay. Rainey, a longtime fixture in the jazz world, has been the foundation of diverse bands led by Tim Berne and Fred Hersch. Since he began collaborating with Laubrock, he can be found in her bands Sleeptheif, Anti-House, Ubatuba, and the Ingrid Laubrock Octet. The saxophonist joins Rainey in his trio with guitarist Mary Halvorson, and have released three stellar discs. This live recording follows the partners initial studio session And Other Desert Towns (Relative Pitch, 2014). It continues to build upon a solid infrastructure where simple gestures carry the day. The title track doesn't so much announce itself as back onto the stage. 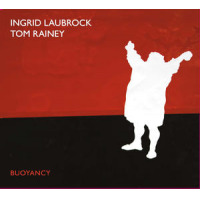 Rainey's whispered cymbal work begets the hushed tones of Laubrock's tenor. The pair build, not so much tension, as an edge. Rainey mixing his complex rhythms against the ultra-supple agility of the saxophonist's tone. As the piece hits it's zenith, you understand they will deliver your ears back, safe and sound. The longest piece, "Twenty Lanes," begins with brushes and, is that crinkled paper? The momentum inches toward sticks, then the drum, and Laubrock juxtaposes some Evan Parkersounding lines against Rainey's off-centered sounds. Let's call this music, the capture and release of beautiful creatures. Track Listing: Buoyancy; Twenty Lanes; The Museum Of Human Achievement; Thunderbird. Personnel: Ingrid Laubrock: soprano saxophone, tenor saxophones; Tom Rainey: drums.